Meet Dr. Louis Charles Roundanez, founder of The New Orleans Tribune, circa 1864. You’re not imagining things, the modern Tribune is part of a publishing legacy that began 153 years ago, when Roudanez published the first Black daily newspaper in the United States. Then, as now, The Tribune was dedicated to social justice and civil rights for all Louisiana citizens. Like his successors, Beverly Stanton McKenna, Dr. Dwight McKenna, and Dr. S. Mark McKenna, Roudanez broke new ground in American journalism. Born in St. James parish and reared in New Orleans, Roudanez studied medicine in Paris, France, where he earned his first degree. He received a second medical degree at New Hampshire’s Dartmouth College. 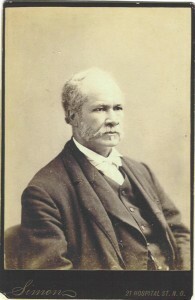 Roudanez used his newspaper and medical practice to bridge the gap between African-Americans and the majority population. Drs. Dwight and Mark McKenna have been similarly inspirited. In fact, the McKennas began the modern Tribune in 1985, in part to honor Louis Charles Roudanez’ amazing journalistic legacy. So when you pick up a copy of the modern New Orleans Tribune, you are not only picking up one of the most respected African-American community newsmagazines in America, you are sharing a part of history — a contemporary publication that speaks to the issues of today as eloquently and as forcefully as Roudanez did then. We don’t publish The Tribune in French and English the way Roudanez did in the 1860s. But we think he would have been proud of how well our Tribune speaks the language of the modern African-American experience.